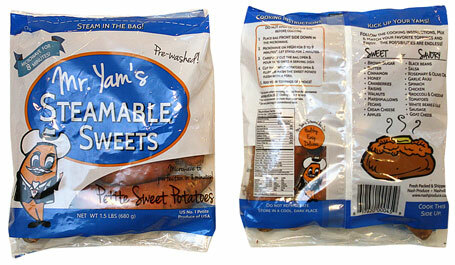 Mr. Yam Steamable Sweets are the perfect solution to a quick meal or side dish! Filled with 1.5lbs of petite sweet potatoes, each bag is microwave ready in just 8 minutes. With Mr. Yam Steamable Sweets, there is no preparation or cleanup involved! All potatoes are pre-washed. Private label available upon request. Place the unopened bag front side down in the microwave. DO NOT pierce the bag. Microwave on high for 8 minutes, let stand for 2 minutes. Carefully cut the top of the bag and pour onto serving dish. Check out our “Recipes” section for some of our favorite ways to prepare our sweets!